Or maybe it's combat boots. I don't really know what that expression means, but I think it was a fairly offensive put down back in the day. Well, I have a new version. My daughter wears ugly boots. Seriously ugly. Of course she loves them to pieces and plans to wear them every.single. day. 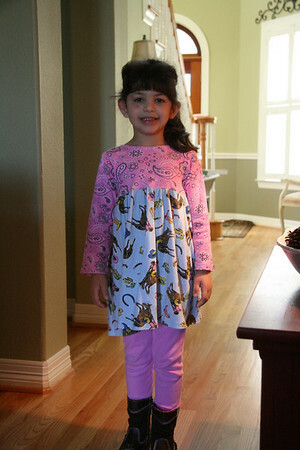 Thursday evening she and Scott went on the hunt for cowboy boots for her little Rodeo Day at school. This is what they came home with. Brace yourselves. I didn't know what to say as I stared at the combination of faux suede, brown leather, pink stitching, oddly squared toe and, oh yes, a buckle. Obviously the designers couldn't decide between a cowboy boot or a steel toed work boot all with a throwback nod to the 1970s. So for Rodeo Day Annelise wore her cute cowgirl legging outfit with The Boots. Leggings tucked in of course. In my head I hear the chorus of, "Your daughter wears ugly boots! Your daughter wears UGLY boots!" I guess I will grin and bear it. hee! hee! well at least you can overlook them if SHE loves them so much..
How funny! I bet she was the envy of all the girls in her class! I actually adore those boots. 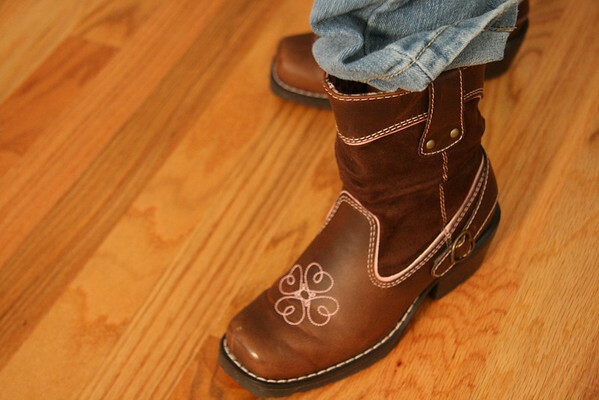 Since I wear cowboy boots at least once a week, you can possibly understand why. She's adorable! Oh Yeah, my Griffin wears his boots every chance he gets, even with shorts! so cute! i love that she looks genuinely over-the-moon to have them on her feet. :) those will be memory makin' boots. How in the world could anything that A did or wear be horrible? She is a trend setter. FOR SURE. The pink stitching did it for me. I feel your pain. :o) I have several, let's just say odd, dressers in my home! My tongue is really started to hurt from all the biting!